butternut squash. Sweet and spicy. New Year's Day is almost upon us. Rather than wax nostalgic and dreamy about the bumpy (and enlightening) year I've had, I'd rather post a simple recipe I know you'll love. Making a pot of bean soup or chili to welcome in a freshly minted year is a tradition as old as the hills. From Italian Pasta Fagioli to homestyle southern Hoppin' John, beans somehow acquired the favorable reputation of attracting good luck. Why? I haven't a clue. But I do know this. 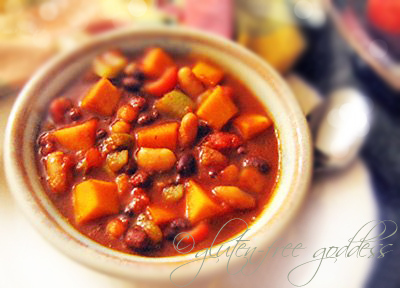 Beans paired with cubes of winter squash make for one sweet and tasty chili. That, Dear Reader, you can take to the bank.